I wasn’t sure about The Death of Stalin to be honest as it really didn’t seem like my cup of tea but I gave it a shot as the reviews have been glowing, and my suspicions were confirmed – it really isn’t my thing. The film is basically a comedic take on what happens within Joseph Stalin’s circle after he dies, following the appointment of the new leader and the growing unrest between Lavrentiy Beria (Simon Russell Beale) and Nikita Khrushchev (Steve Buscemi). I think it really helps if you know your Russian history and/or politics because you get the injokes, you know the background and you know the real life people the actors are sending up. I had no idea at all. For that reason, it all went over my head and I couldn’t appreciate it in the same way a knowledgeable person would. Even still, the comedy isn’t consistent. I laughed a lot in the beginning, primarily at the actors keeping their actual accents even though they’re playing Russian, and it was funny before and immediately after Stalin (Adrian McLoughlin) dies, but after that the novelty wears off and I got a bit bored trying to follow it and I switched off. I think it’s a really specific kind of comedy that I simply do not get and it flip-flopped between being really smart and witty to being very basic and immature. There are some great turns from Jason Isaacs and Paddy Considine and it was funny watching Buscemi, Jeffrey Tambor, Michael Palin and Paul Whitehouse etc playing these top Russian people. I just wish I knew more about who they were trying to be. Death of Stalin was just not my bag at all. 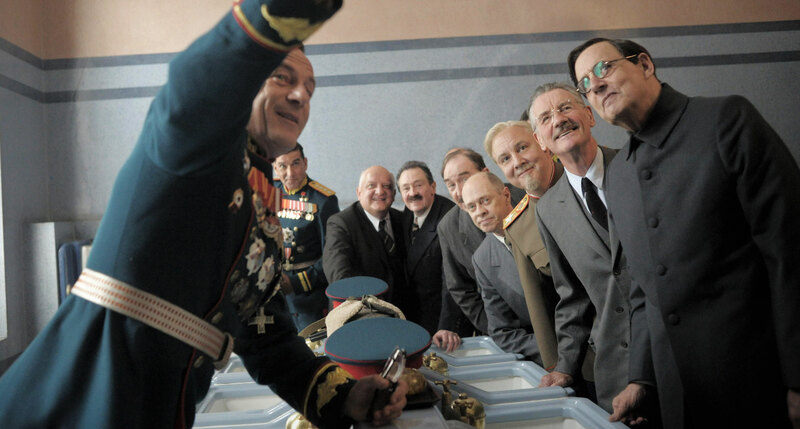 I could appreciate what it was trying to do, make a black comedy about the dirty dealings of the Russian government, but that’s quite a difficult balancing act as some of their atrocities are simply not funny and attempts to make them comedic weren’t always successful. Death of Stalin will do well with a specific set of people, ones that know Russian politics well and can appreciate what Armando Iannucci is trying to do. Unfortunately, I am not one of them.